Explorers can seek out nearly 90 geocaches at over 30 national parks and partner places across the U.S. as part of the Find Your Park GeoTour. 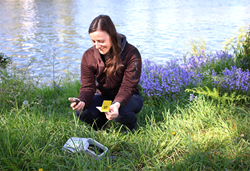 Nature and exploration come together as a geocacher makes a find. Our mission is to help everyone become an explorer. We’re thrilled that geocaching gives people another reason to explore national parks. In honor of the National Park Service (NPS) Centennial and the “Find Your Park” campaign, the NPS and Geocaching HQ have launched the Find Your Park GeoTour to help millions of geocachers celebrate national parks and partner places. At least 30 parks have registered a total of nearly 90 geocaches for the GeoTour, and additional parks are currently developing geocaching programs. "The National Park Service is proud to work with Geocaching HQ on the Find Your Park GeoTour," said NPS Northeast Regional Director Mike Caldwell. "The national parks across the country participating in this program are ready and eager to welcome geocachers from around the world to some of the extraordinary places that make up the national park system." Geocachers use a GPS device or the Geocaching® app on their smartphones to navigate to a set of GPS coordinates and then attempt to find a hidden traditional geocache container or geological feature to document (EarthCache). The National Park Service permits geocaching when the activity is directed by park management and has an educational component. Geocachers can also experience national parks and partner places through existing GeoTours: Rocky Mountain National Park, South Park National Heritage Area, Mount Rainier National Park, the Santa Fe National Historic Trail, the Star-Spangled Banner National Historic Trail, the Captain John Smith Chesapeake National Historic Trail, and Utah’s Mighty Five® national parks. There are more than 2.8 million geocaches in the world and approximately 3 million active geocachers worldwide. Users can register for an account at Geocaching.com. About the National Park Service. More than 20,000 National Park Service employees care for America's 411 national parks and work with communities across the nation to help preserve local history and create close-to-home recreational opportunities. About Geocaching HQ. Based in Seattle, Wa., Geocaching HQ was created to support the community-based activity of geocaching on Geocaching.com, inspiring discovery, exploration and adventure in more than 180 countries. Geocaching images are available for the media to download at http://www.geocaching.com/press/faq.aspx.